In this age of Social Media, I’ve got to admit, I like the retro sky writing medium chosen by Saber to air his grievances at Mayor Antonio Villaraigosa and the L.A. City Attorney’s office over the mural moratorium. The moratorium, which has been in place since 2009 equates murals to signage thereby imparting a complicated and costly permit process (including custodial services) on any planned mural. Opponents to the ordinance state that it effectively thwarts the creation of new murals while sanctioning the proliferation of billboards. 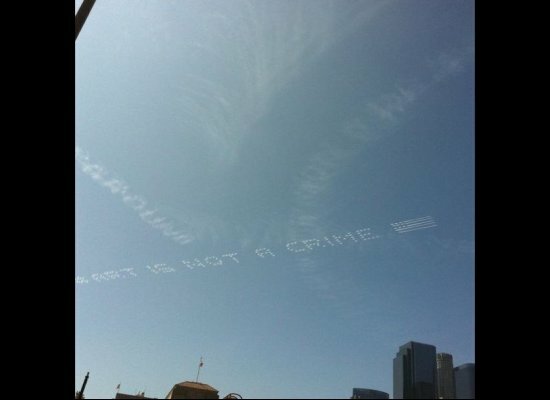 Saber took his protest to the skies over Downtown Los Angeles yesterday. How did I miss this? I work Downtown! You know, I saw this yesterday as I was leaving my place. Didn’t realize what it was. Good to see you back!